The Tilting melanger, the pride of our stables, has been crafted with precision and quality, with non-corrosive components, and it has also been designed taking ergonomic aspects into consideration. Low on noise and vibration, it has especially been built to handle the high volumes of output generated in less time as required of a commercial establishment like that of yours. An additional feature in the form of the coconut scrapper is also present so as to make work easier. The classic Titling feature makes it unnecessary to have to lift the vessel or drum to pour out the contents. Simply tilt and pout it out and avoid straining yourself. Cleaning is a breeze, simply pour water, run the melanger for a few seconds and pour out the water. It almost cleans itself. Solid 100 % SS 304 Stainless Steel body provides elegance, strength and durability. In addition, this melanger has all the features that make it stand out like powerful motor, gear drive, exhaust system, black granite stone for long life and high quality internal and external components. The Electra turns to be the queen of your kitchen and its smart look simply blends with your interiors. Its capacity of 20Lbs is just perfect to meet all the needs of a compact family. 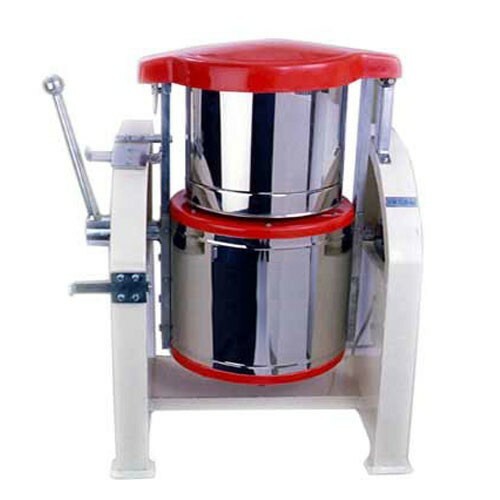 It is equipped with powerful ½ HP motor and patented cylindrical stones for professional grinding and prepares your favourite idly batter and dosa batter to perfect consistency. With the help of this wet melanger, you can attain the perfect touch to prepare some yummy dishes for your family. Its shock proof design ensure safety. The drum of this table top wet melanger is made from 304 food grade stainless steel that makes it a rust resistant appliance and boosts the melanger's performance and life. Batter cleaner makes it easy for you to clean the cylindrical stones for hygienic grinding. Electra has set new standard in the world of kitchen appliances. Electra wet melangers, with the revolutionary patented commercial melanger, have proven effective in delivering batter that is great in quality, taste and quantity. Add to this, the finest usage of rust-resistant, food grade stainless steel to make sure your food is healthy. With its robust build quality, Electra turn into the perfect choice for your kitchen. Grind better for crisp dosas, soft idlis or fluffy vada! Electra wet melangers, manufactured with highest quality materials, are designed especially to handle your wet grinding jobs smoothly, making it a truly multipurpose companion for you in your kitchen. The outstanding designed grinding stone with larger contact area supported by heavy-duty motor ensures faster grinding. Usually shipped via sea to your nearest sea port only. In case of express delivery via air to nearest air port or need home delivery please write to us with your full addres to receive quote. Electra 20 is specially designed to grind cacao and nut to get smooth butter and creame chocolate. Electra20 is having Hard Black Granite cylindrical stone rotates over the hard black Granite stone base drum. 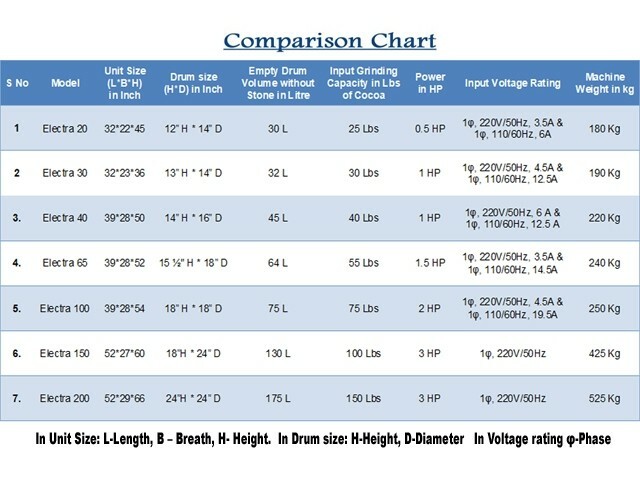 5.What is grinding capacity of Electra 20? The Capacity of Electra 20 is 20Lbs. 6. What is the maximum running time of Electra 20? Usually, Electra 20 runs upto 24Hours. 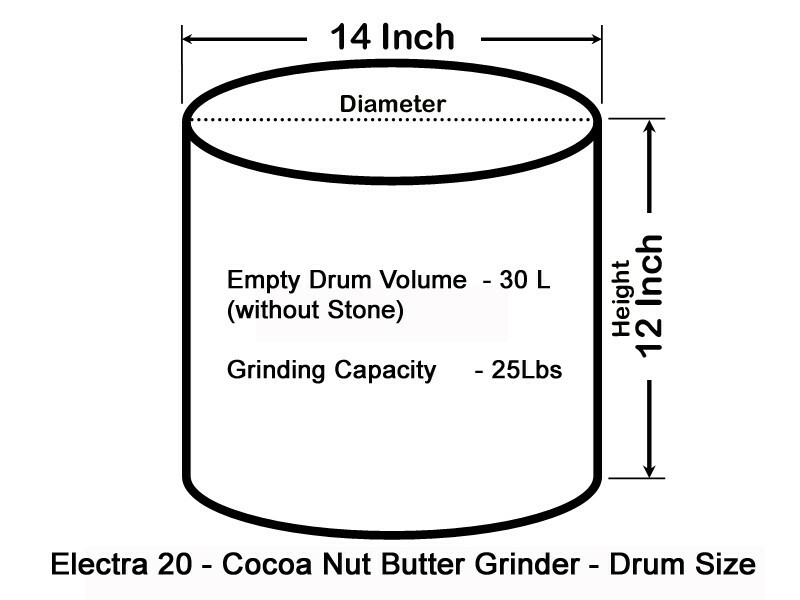 Since Cacao grinding, nut butter process are hard to grind, Electra 20 is designed for this purpose of continuous grinding to get the smooth and soft chocolate and nut butter. 7. 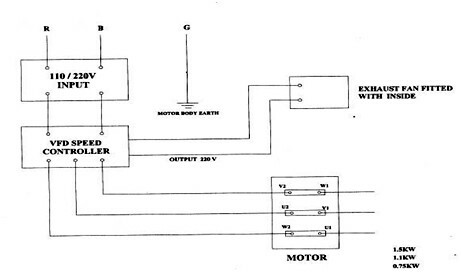 What is function of Electra 20? Electra 20 is a 220 Voltage single phase table top Chocolate melanger in cherry colour, metallic body grinding capacity is about 20Lbs. Approx the net weight is about 180 Kg.